Jennifer Cluff: Teachers playing along with students? Teachers playing along with students? Dear Flutists, A terrific conversation on Flutenet today. What a wonder that there are two different points of view on this topic. I would have always thought that playing along with beginner and novice students was part of every lesson. Interesting read! I was at a masterclass with a couple of my students given by Petri Alanko. It brought up a question...maybe controversial enough to get all the flute teachers talking? Not sure. We flute teachers noticed that Petri did quite a bit of playing along with the students. We brought this up later, one of my colleges said she did the same, the rest of us didn't (and couldn't remember seeing other teachers doing it). Petri's explaination - and my college's, was that it's easier in early stages to 'explain things' by playing along. Petri also admitted to thinking there was some kind of 'resonance learning' going on - playing so close to the student so that they feel as well as hear (and see) the example. Do any of you play along with students? Petri did say he does this with younger students, or in the beginning stages of learning a piece, once the student is looking for their 'own' expression he stays out of the way. I'd love to hear comments from you all! I do it all the time K. I warm-up together with the student, I play along in pieces ( in addition to hearing them solo), I play duets and probably spend about 50% of lesson time actually playing myself. Like Petri I do it less as the student matures. The reasons for this are several; for one young students learn better by example and trying to copy than by getting lots of instructions. Of course they will get some directions from me, but I will often play with them as they try to do what I said. That brings us to the second reason; a modern flute is designed to play in tune (relatively;-)) and with good tone. A student wildly stabbing at the first sound they find is learning nothing. They need the stability of stable intonation so that they can find out where to place the flute, how to play it in tune and of course the consequences of not paying attention to this. 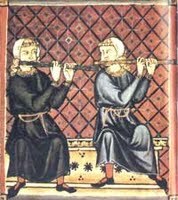 Which brings us to the 3rd reason; as the flute is designed to play in tune and with good tone, I am giving them an idea of what that good tone might be once they are in tune. The dual aims of playing in tune with good tone teach them to blow the flute properly much better than any long lectures from me that go in one ear and out the other. They need good examples to aim for when practicing at home. We need to build musicality and aptitude before any amount of theory has anything to cling to. And lastly, musical intelligence is developed and assimilated from a vast array of references and not something that can be taught. Unless my young students are using I-Tunes to listen to top flautists on a regular basis, their lessons with me are the best opportunity there is to help them assimilate the references they will need to play the flute musically and with personal inflection. There is a vast difference between this and some teacher that has remote-control monkeys where "musical meaning" has been decided on by the teacher and rehearsed to the Nth degree. Even if they are listening to top flautists on a regular basis, it is not sure that this will help them play musically in the short term. What they hear will be impressive and motivating for them, but it will be so far removed from what they are actually working on that it will be an abstract experience as far as their own playing goes. In short, I play along regularly with my young students because I want my students to be independent musical beings from an early age and that they play the flute in such a way that it gives me, the student, their family, their peers and anyone else in earshot, pride and pleasure to listen to them. This is a *great* conversation! I agree with all those who've given opinions so far. In fact, I'm stunned by the thought that there are private teacher who think they should *not* play along with their beginner and novice students. As Dean points out, analytical, descriptive, physical instructions are not well absorbed, (in one ear and out the other) whereas sound imitation is the most obvious way to learn music. What possible argument could there be, except in the case where some doofus private teacher plays on top of the student so much, the student never plays by themselves, nor can hear themselves well. And yes, as the student progresses, the teacher gradually stops playing along on every other piece, and this leads to the intermediate student playing solo for most of the lesson. At either end of a one hour lesson, playing duets helps continue more subtle musicality. Without youth orchestras or mixed-instrument chamber group enrollment, flute duets/trios/quartets, imho, should always make up a large part of the intermediate flutist's course of learning. Yes, one can clearly hear that the basic band flutist has only ever imitated the (dreadful?) doubtful sounds he/she has heard in band. I hear that all the time too. The "flute tone quality" bar in big noisy bands can be set so low that even students with "good ears" have minutely copied the untutored, nay horrific blasty tones they've heard around them in band. The private flute teacher may well be, as P. says, the best flutist the student has heard all week. I wonder why the heck that is, but it's often true. And, obviously, those students with good ears and a feeling for music will need "playalong" for alot less time then those who never listen to good music. I'd mention that we also need have them display their own understanding of rhythm and meter through performing on their own without any form of cues from others. Of course B., but that understanding needs to be built first. Remember that notation is simply an abstract representation of a musical pattern. Unless the visual recognition of such patterns is closely linked to how they should actually sound musically, one is left with the note-by-note static performance that so many fall foul of. than when they perform a well rehearsed piece. Their instinctive responses to the material they are presented with are the true test of their skill and understanding. >>along in pieces ( in addition to hearing them solo), I play duets and probably spend about 50% of lesson time actually playing myself. Like Petri I do it less as the student matures. Thankyou for this conversation. Most helpful to all of us. This is a great post, Jennifer! I play along with my students for about half of the lesson. When I first started teaching I didn't play as much, but after I started playing along I noticed an improvement in tone and rhythm in most of them. Thanks Aubrie, Yes yes yes, me too! I noticed the difference it made, and although I use it sparingly, the students improve so much more quickly, especially in the first year or two. And don't you just love Kuhlau duets for the more advanced flutists! Playing both with them and for them is invaluable for demonstrating tone, intonation, articulation, dynamics, etc., etc. The balance shifts as each student grows, but I would advise never having a lesson without your instrument in reach. As a band conductor, I keep 5-6 within reach! Keep in mind that most students have never heard a single note of 'classical' music, and everything from the notes you play to just the way you focus are big eye openers for students. This is a very interesting topic that I have to admit, I have thought about a lot. One of my former private teachers played waaay too much in my lessons. In my opinion, it only hurt my playing and abilities as a musician. Of course imitating her was simple and I sounded to others like I knew what I was doing (after all, I sounded like my teacher who is a very well-respected flutist). My dirty little secret was that I had absolutely no idea why I was doing the things I was doing or how to learn a piece without having first heard someone else play it. This led to a dependence on recordings. To be honest, it was crippling only I was the only one who was aware of the problem. After switching teachers, everything changed. My new teacher is extremely analytical and has thought through all aspects of flute playing very thoroughly. We actually spend most of our lessons talking and discussing music and the particulars of flute playing. I have improved beyond belief. Although I still play during my students' lessons, I try to limit it so as to avoid having them copy me. It seems to me that playing for students often offers a quick fix that seems to yield progress but, in the long run, only hurts the student's intelligence and independence. Finally, it is always important to note the different methods of learning. People like me can copy blindly while learning very little. A more encyclopedic approach is what I have found truly helps. Everyone is different, I suppose.